NL18-1096695 LADY M’BAPPE is from super pigeon M’BAPPE!!! LADY M’BAPPE is from super pigeon M’BAPPE!!! M’BAPPE is from SUPERKWEKER x BALLERINA. 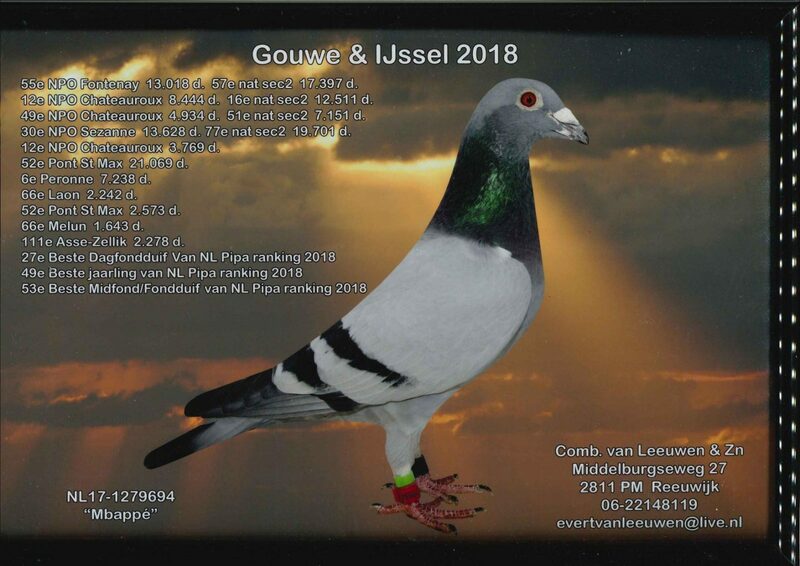 The father of SUPERKWEKER is a brother of TRUDY, the winner of 1.NPO Blois 6.333 pigeons! LIEVE 91 is inbreed to the 1st Acepigen dpt 7, Midden-Nederland, the 634. She is from MAKKE 20 x RODE STAMDUIVIN. RODE STAMDUIVIN is from 2x TXT winner SUPER VALE x a daughter of the 634, the 1st Ace pigeon dpt 7 Midden-Nederland.